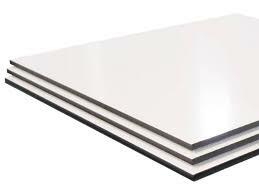 Aluminium composite sheet consists of a polyethylene core sandwiched between two 0.3mm aluminium skins. With all the benefits of aluminium composite and the full range of colours and finishes, combines durability with flexibility. Particularly suited to high wear environments, this formable and dual-sided sheet has one satin finish surface and the other in 75% gloss. White sheets now come with an ultrawhite finish as standard for optimised printed colours. Aluminium composite sheet comes with a 5 year external guarantee including brushed aluminium (other brushed and mirror finishes are guaranteed for internal use only).